« *** WINNERS *** Shellie, Heather, Julia and Emmy are Living the Life of Riley! CONGRATS! 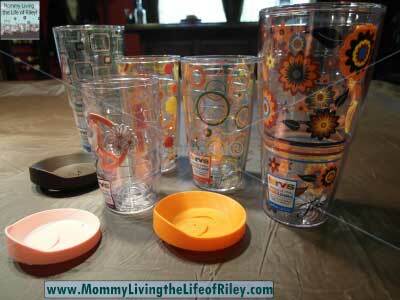 What Happens When Tervis Insulated Drinkware Merges with Fiesta Dinnerware? LOOK! Being a busy mom on the go often means that I'm toting my favorite beverage right along with me. Riley has a wide selection of sippy cups and other travel mugs that she uses, but finding an all-in-one solution for my travel needs has proven rather difficult. Sometimes I like taking a hot cup of coffee along and other times I want to carry a nice cold glass of lemonade. Recently, I've found a perfect solution, which allows me to travel well with either hot or cold beverages and even looks extremely cool too! Tervis, the leader in insulated drinkware has recently partnered with Fiesta Dinnerware, the leader in casual dining, to create a collection of Fiesta inspired tumblers. Riley and I recently had the chance to review several pieces of this collection ourselves. Keep reading to learn more! Today, there are four Tervis Fiesta collections (Cool, Sunny, Citrus and Mediterranean) which I had the opportunity to see for myself. Fiesta and Tervis are both known for vibrant colors and fun, casual entertaining and this new Fiesta tumblers collection definitely captures both of these qualities well. Tervis's crystal-clear, insulated drinkware is guaranteed for life and has been made in America since 1946. These double-walled tumblers have the unique property of keeping cold drinks cold and hot drinks hot, so they're perfect to use no matter what you're drinking. The seal-tight lids increase their functionality and convenience, making Tervis tumblers virtually spill-proof. The 16 oz. and 24 oz. tumblers are designed to fit perfectly in your car's cup holders. Tervis tumblers are both dishwasher and microwave safe too, and because they come with a lifetime guarantee, you can be sure that these tumblers were built to last. Riley loved drinking out of her new 10 oz. Wavy Peace Sign Tervis tumbler, for it is easy for her to hold yet still looks like a "big girl" glass. Couple this tumbler with the seal-tight lid and you have one extremely kid-friendly cup! 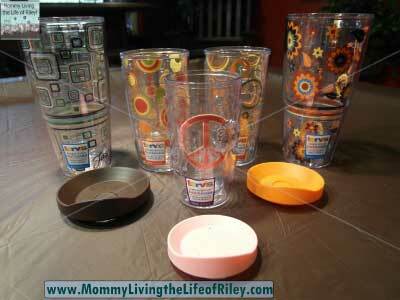 I couldn't be more thrilled with the new Tervis Fiesta Collection Tumblers. These wonderfully designed travel cups are perfect for carrying either hot or cold beverages, fit perfectly in my car's cup holders, look great and are a cinch to clean! Although I started off using these tumblers just for traveling, I've found myself gravitating towards them while enjoying beverages in the house too. The bright, lively patterns of this collection instantly lift my mood and make drinking normal beverages much more fun! Disclosure: I received the Tervis Fiesta Collection Tumblers and Lids shown above from Tervis in order to facilitate my review. No other compensation was received. This product review is based on my own personal experiences with this item and is completely honest and objective. 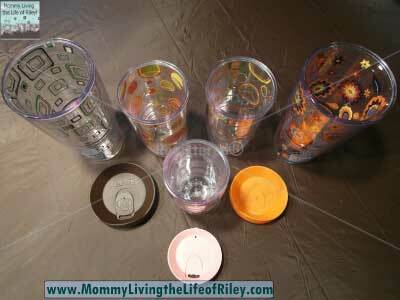 4 Responses to What Happens When Tervis Insulated Drinkware Merges with Fiesta Dinnerware? LOOK! Hi there. Thanks for sharing this info. My nephews and niece are surely going to love ’em! Very, very nice. I love these. Wow those are so adorable I love the bold designs and bright colors! I’m going to have to get some of those!